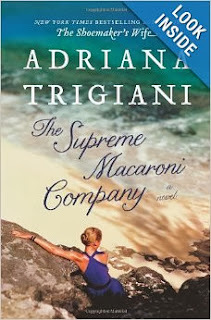 So, Adriana Trigiani has produced another book, The Supreme Macaroni Company, that I am currently devouring like a bag of biscotti at breakfast. This story continues the saga about the Roncalli and Vechiarelli families and their Italian laden lives that revolve around the Angelini Shoe Company we all remember so well from The Shoemaker's Wife. Trigiani's books are vivid tales about Italian life in America and in Italy that will leave you feeling like you just spent a few days in a house of twenty strong personalities with your time spent mostly in the kitchen. You'll come out exhausted, but well loved. "That's my dream, a mutually satisfying committed relationship that takes place over iPhone. Just odd symbols and snippets of thoughts and feelings punched into the phone with my thumbs and no one in my face bugging me for actual conversation. That, I could sustain. I could do that. A text-y marriage." I have to smile. I just love the characters in this book. If you haven't read The Shoemaker's Wife, quick - go read that first, it was incredible. Then grab this one and gobble it down.